Photo credit: Toyota Gazoo Racing; screencap via my browser that couldn’t load anything during the hack. The official paid live stream of this year’s 24 Hours of Le Mans was unusually bad, blacking out for chunks during the race. Fans unhappy with the stream’s quality were advised to request refunds, but many were initially denied. Thankfully, it sounds like they’re finally making good on users’ refunds now that the dust has settled—and no user information was compromised. The World Endurance Championship hosts the live stream for Le Mans, as the race is the flagship event of their season. Usually, it’s a fairly solid way to watch the entirety of the race without any commercial interruptions, however, this year, the series said that cyberattacks originating from Korea and the United States ground the service to a halt several time throughout the race. The main attack came from Korea and a smaller one from the US. 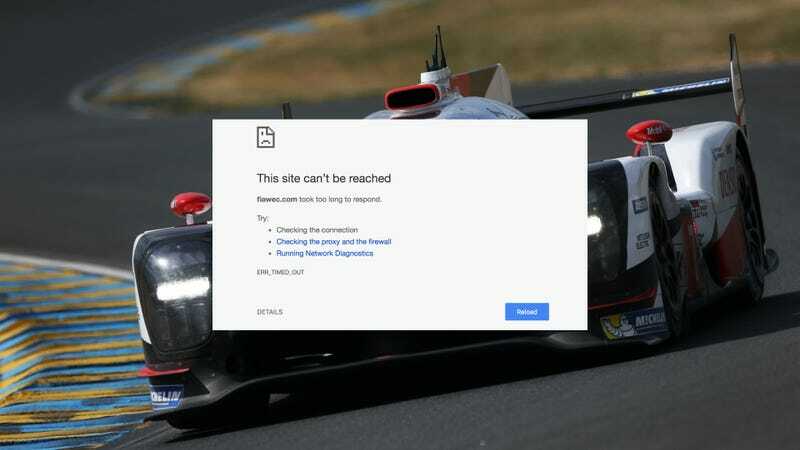 Our experts consider that the problems encountered during this edition of the 24 Hours of Le Mans probably echo the attack faced by the South Korean web hosting company NAYANA which was affected by the Erebus ransomware. Many sites were impacted by this attack, including media sites such as www.endurance-info.com. NAYANA had 153 of its Linux servers infected with Erebus ransomware that affected 3,400 businesses that use its hosting service, per Trend Micro. The Erebus ransomware has no relation to the Australian Supercars team, thank goodness. Fortunately, the WEC representative stressed that no user data was compromised in the attacks, and that the issue has been identified and fixed. During the race, the WEC told frustrated users to email App24h@lemans.org for a refund through its social media accounts. However, users who emailed that contact address often found their requests denied. Additionally, the tweets advertising the refund were deleted, although the Facebook post stayed up. Our platforms have suffered attacks which prevented our serevers to respond properly. The entire race is available in replay. We apologize for any inconvenience this may have caused, please be assured that all teams are working hard to ensure the best possible availability of the Application & Live Web. It is fixed now and you can watch live on the app and website. For users who specifically paid to watch the live stream in real time (live! ), this wasn’t what they wanted to hear, especially after the WEC had publicized that they were offering refunds. While the terms and conditions for users indicates that there is no obligation to make a refund, as the cause of the disruption was due to an external source, we will examine every case individually as our subscribers are very important to us. There is a team of people doing this at the moment so please ask any viewers/fans who contacted you to bear with us. Enquiries should be sent to app24h@lemans.org. So, if you sent a refund request because the race you paid to watch live wasn’t available then, try sending it again. Emphasize politely that you paid to watch it live, and include your order number for good measure. Now that the traditional Le Mans hangover is over, it sounds like everyone’s finally on the same page and they’re finally honoring users’ refund requests. A user on r/WEC posted that he had received a refund for his request today after trying it again, so that’s promising.